Got some green dragons a few days ago and thought I would post a pic of one of them. Got 4 and hoping for a pair, but if not will cross breed with one of my longfin browns and work on setting longfins in them. Quite cute! I hope you can get a pair! Good-looking greenish Bn, Susan. Are they regular Bns with missing pigment? What's the background of these catfish? Actually they are just a colormorph of the common bns. But to me there is a little differences in the body shape. But you know me and bns. I do indeed! The burgeoning cheek bristles are so cute. I have not seen a male loricariid of any species that does not have them, but maybe there is one? I know some females can have them, too. My female Panaque maccus had some pretty impressive ones. Do you know if the fish in the pic above is a male? Not yet, the 4 are pretty young, hoping to get at least 1 female. Oh Deb, I am getting a common to put into the big tank but is going into the 90 till I get it redone in the spring. He's already pushing 15 inches. Nice one to. Pick him up Thursday so will take a pic of him before I put him in the tank. 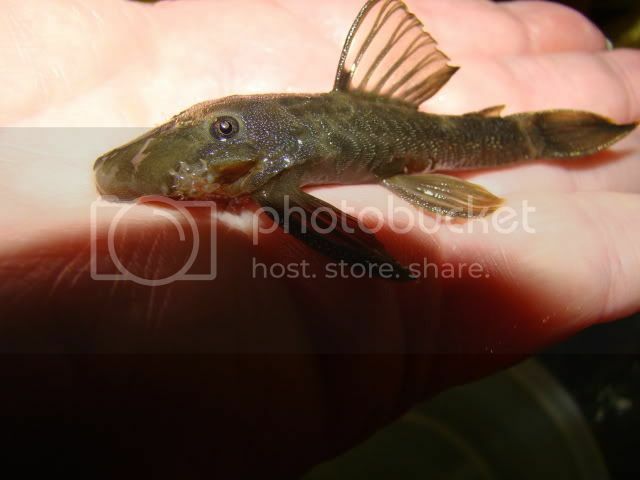 To the average Joe we must be seen as really "out there" to look at a pleco like that and think it's "cute", but they really are, aren't they? Thats right Marcos, But I have this problem called pleco fever. I love them all and Just glad I have tanks big enough to handle them. Oh I will do that. Also want to get a pic of the other one they have and he's bigger.